There's no stopping this project any further! 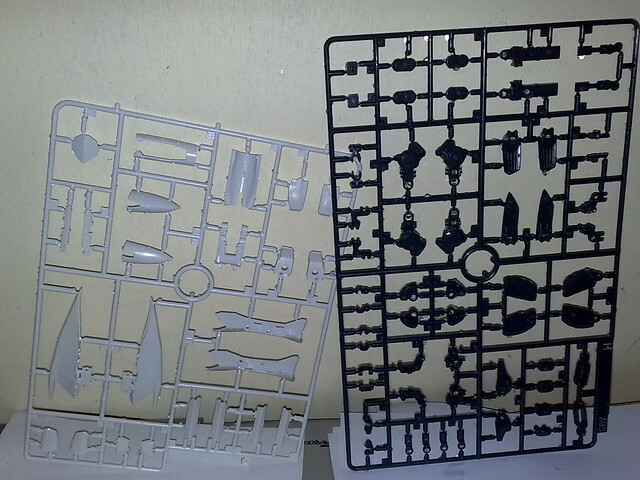 I decided to finally start building the 1/72 VF-25G Messiah from Bandai that I had bought at Hobby Link Japan when it was on sale. I'd be satisfied right now with only having the two main colors available since I would be displaying this kit in battloid mode, meaning that it will hide the other unpainted parts of the kit. English translation of the manual had gone far enough for me to be able to work on the project despite not having finished yet with the translation. I felt that with the actual building and waiting for the paint to dry on the kit, it would give me adequate time to finish with the translation. So the first thing I did was to wash the plates with detergent and water in order to remove any remnants of release wax used by Bandai during the molding of the plates. This will make sure that the paint will stick evenly on to the surface of the model. The process is quite easy, just detergent and a sponge. Some recommend using warm water but I skipped that part. Just ran the detergent filled sponge gently on the plates and its parts, being mindful that none of the parts accidentally fall of. Then waited a few minutes for the detergent to soak on the plates then washed it off again with slow running water from the faucet. Made sure too that I got both sides of the plates. Afterwards found a nice place where I could lean up the plates for air drying. Made sure too to put used paper underneath the plates so that it doesn't make a mess of the room. Once that's done will start cutting and labeling the parts from the plates for a little spray painting session.